Don't let the size fool you, this is a big balloon. Much easier to install on roofs than the 26' but still big enough to see from the street. Excellent visibility when ground installed in front of buildings. Can be installed where low power lines are a factor. Remember, power lines are about 22' 25' from the ground so make sure of overhead clearance. All of our rooftop hot air shaped balloons are made of high commerical, UV covered leasing grade 7.5 oz. nylon. Tops and foundations are made of 18 oz. vinyl. Deflation flaps, 12 welded metal D-rings for tie-down anchors. Balloon is sewn with machines that stitch twice: envelope is stitched twice and afterwards, top stitched by a two-needle machine (4 stitches per seam). All balloons are equipped for light equipment. We are a custom manufacturer of high quality outdoor gaint advertising inflatables. We can custom make any inflatable to resemble any character or logo. We have very fast turn around time because we are the manufacturer and do not outsource or resell. 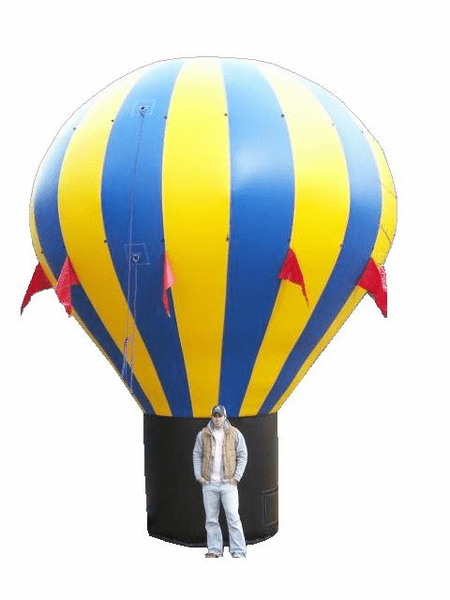 We sell air blown dancing tubes and guys as well as giant rooftop, hot air shaped balloons. We custom make banners for these balloons. We make giant gorillas and any character. We also repair any inflatable including inflatable jumpers, slides and obstacle courses. www.inflateonline.com covers USA, Canada, Puerto Rico, Chicago, Atlanta and Houston : - custom inflatable ad blowup - air dancers.